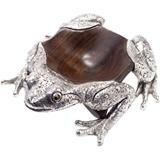 From Vivre: "A beloved Asian token of profit and luck, the sprightly frog is lovingly immortalized in this exquisite bowl, created from luxurious, gleaming tropical hardwood with striking accents of silver. Hand crafted by artisans over the course of a full month!" 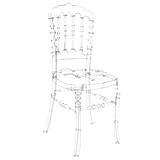 MISS CHAIR $16,000.00 From Vivre: "A modern update of a classic silhouette, this whimsical chair is a stunning collaboration between art and furniture. 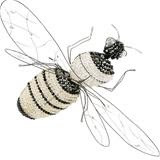 Incredibly detailed, this unique piece was created as part of a five-chair set displayed in the windows of Roger Vivier to elegantly display a new bag made by Bruno Frisoni for Carla Bruno Sarkozy." BEE WALL SCONCE by Marie Christophe $14,000.00 Delicate hand-placed crystals and wire combine to make a truly unique light source in the shape of a whimsical bee. Each piece is handmade. ITALIAN LEATHER BAR $8,500.00 Reminiscent of a prop from the set of Citizen Kane, this iguana-embossed Italian leather trunk bar is as unique as it is elegant. 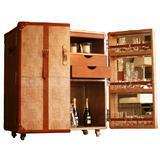 Mirrored double doors open to reveal a fully functional bar that includes two padded leather drawers, a sliding glass shelf, and ample storage space for bottles and glassware. On the exterior, twin tobacco leather belts, matching iguana-embossed leather handles, and polished chrome studs give this rare piece even more old world charm. Handmade. These pieces are over-the-top fabulous! The Frog bowl is the centerpiece for your dining table, kitchen island and living room coffee table and it never has to be filled. The lucite chair is a charming twist on what we have seen reproduced over the last decade but with more detail- and the name, is the best! I can picture the Bee wall sconce lining a hallway - whimsy and playful but not loud. The leather bar is tough to place but in a sophisticated 'man cave' it would be awesome.